Alex Guarnaschelli is the daughter of esteemed cookbook editor, Maria Guarnaschelli. She spent her childhood surrounded by global cuisine dictated by whatever book her mother was working on at the time. This early emphasis on her palate shaped her future in food, and upon graduation from Barnard College in ‘91, Alex decided to further explore her culinary interests. Throughout her culinary career, Chef Alex Guarnaschelli has worked in some of the world’s top restaurants including Guy Savoy’s eponymous Michelin three-star kitchen in Paris, Larry Forgione’s An American Place, Daniel Boulud’s namesake Daniel in New York City, and Joachim Splichal’s Patina restaurant in Los Angeles. 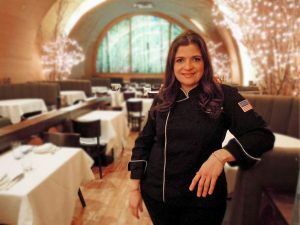 Since 2003, Guarnaschelli has helmed the kitchen as executive chef of Butter Restaurant, where she brings New Yorkers a menu of eclectic American and green market-inspired fare. In addition to her restaurant work, Guarnaschelli inspires millions of viewers with her shows on Food Network. She is a recurring judge on the popular prime-time series Chopped and a chef coach on America’s Best Cook. In 2012, she bested nine rival chefs to win The Next Iron Chef: Redemption and joined the ranks of Kitchen Stadium’s Iron Chefs. Alex has also appeared on Food Network’s Iron Chef America as both a challenger and a judge. Alex released her premiere cookbook, Old-School Comfort Food: The Way I Learned to Cook (Clarkson Potter, 2013) in spring 2013, and has a weekly column on People.com where she blogs about her favorite seasonal ingredients, up and coming food trends, tips and techniques for the home cook, and cooking with her young daughter, Ava. When Alex is not in the kitchen or filming for one of her shows, she enjoys traveling to new locales, browsing the Union Square Greenmarket, and cooking with her daughter. 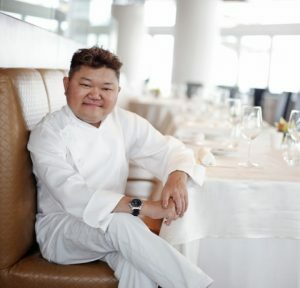 Justin Quek is one of Asia’s most celebrated chefs. With his modern approach to French cuisine that melds a mastery of technique with a delicacy of touch, he singlehandedly put Singapore on the global gastronomic map, and in the process inspired a new generation of chefs. Chef Justin discovered his passion for the culinary world at a tender age, fast understanding that the only way to succeed in such a competitive field was through discipline and dedication. In a career that has spanned over three decades, he has risen through the ranks, starting as a trainee at the Mandarin Oriental in Singapore followed by The Oriental in Bangkok, and these experiences spurred him on to pursue his dream. He withdrew his life savings to finance a year’s trip to Europe, where he worked in the kitchens of some of the most feted Michelin-starred restaurants in the world. Here he honed not only his skills but established his own personal culinary style, which marries the precision of French technique with contemporary finesse, and occasional deft hints at his Chinese heritage.